Nothing is more inspiring to me than hearing from someone close that saw you at your deepest and darkest moments – as they speak proudly of your achievements. Today, I share with you a video that elicits in me the kind of pride I want my children to experience someday. 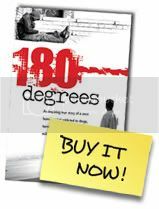 My stepfather speaks about some of the experiences that led to my book 180 Degrees. He says, “It is easy judging situations from the outside looking in. However its accuracy oftentimes leaves a lot to be desired. The man that once threw me out of the home he and my mother shared, now stands up and confidently declares that all the things you read in my book are entirely true. His testament to those tough times makes it even more real for me, now – so many years later – as life’s journey continues on. If not anything else, the one message I hope you can take away from this profoundly heartening note recorded by him, is when my stepfather mentions the opportunity we all have to make a difference in someone’s life. Believe me when I tell you that all it takes is just one inclination. One small spark that needs to be set off in the minds of those that see nothing but darkness and despair, feeling as if they have nowhere else to turn. There are myriad addictions that face countless people in this world and if my book can save just one – only one person – from their plight, I will sleep more peacefully and rest more contentedly for the rest of my life. The things that were said in the video about “spiraling downward” and the “free fall of addictions, dealings, homelessness, threats…” are all very much real and a part of a dark reality that only changed once someone showed me that there is light amidst the pain. Share my story with anyone and everyone you know that is facing the same kind of strife and struggle that I did so many years ago – and if they end up changing their lives as my stepdad so proudly talks about my life changing, you will have just saved a life. THAT is the true hope that addictions can miraculously be overcome.